We have all heard the remarks about Santa Fe being the land of seekers, usually mentioned as a put-down. Granted, there is a fairly large segment of the population that fits into the yoga practicing, mantra sayin’, retreat going, equinox/solstice detoxifying, macrobiotic/vegan/fair trade eating group. (And by the way, full disclosure here: I fit into most of that category myself). Yet, there are times when seekers overlap with art folk. But when and where, one might ask. 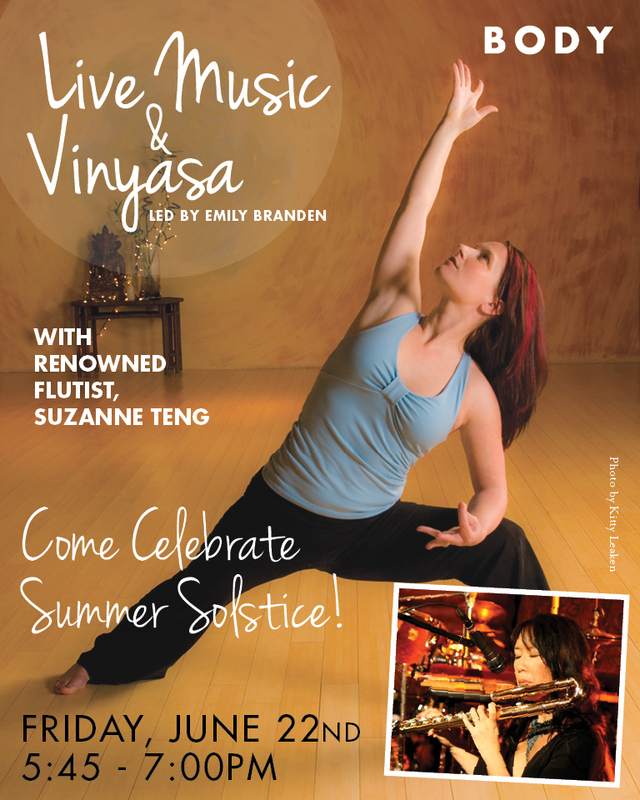 Generally speaking, the third Friday of every month from 5:45 to 7pm, BODY hosts a vinyassa class set to live music, led by the ever-wonderful Emily Branden. But those words alone may not prompt my beloved readers to action. Instead you may be thinking “that’s nice” or “what does any of this really have to do with art in Santa Fe?” Before you surf on over to the next website, or even contemplate spending your third Friday singing karaoke at the local watering hole, just read the next few lines, then close your eyes, imagining: the southwestern sun setting, gracefully moving its rays across the bodies in the studio, while tunes are vibrating through the thick candlelit air. In the past year alone, guest appearances from dj’s, cellists, and flutists have inspired ultra tired, workweek-weary limbs to move through one more blessed downward facing dog. So go on. Be artsy and enlightened in the same breath, and check out Suzanne Teng, renowned flutist, June 22nd. ps: Guest teacher Keith Borden (from Laughing Lotus San Francisco) will be singin’ sweet devotions in a live concert held June 2nd, 7:30 – 9pm. *Free* Yes… that’s right, BODY has a free kirtan shindig happenin’ tomorrow.